Currently the most common types of fillers are resin, oil or nitrogen, which differently affect the capacitor performance, as analyzed below. The better the thermal conductivity of the filler, the more heat will be dissipated, optimizing capacitor’s life. Filling the space between the capacitive element and the metallic case with nitrogen (or air), the internally generated heat will hardly be dissipated, because the thermal resistance of nitrogen is higher than the one of oil or resin. This is similar to what happens in a house with double glazing: the internal temperature increases because of the air between the 2 glasses, being air an excellent insulator, an unwanted feature. Higher working temperature means a shorter life span for the capacitor. 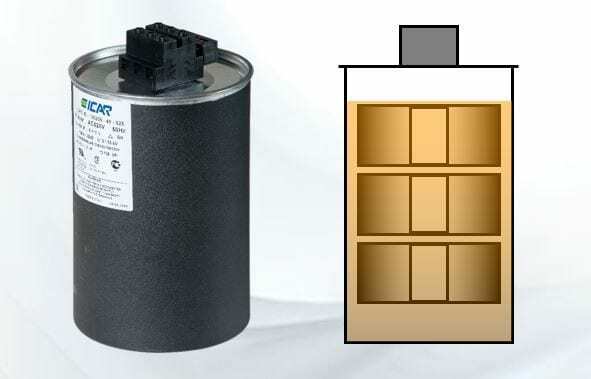 The thermal conductivity of oil and resin is much higher, granting an excellent dissipation of the heat generated while the capacitor is operating. The risk of overheating is therefore reduced to the minimum, in order to obtain the maximum life span of the capacitor. To get an idea of the differences, the thermal conductivity of nitrogen is 0.026 W/m°K, oil’s is 0.15 W/m°K and resin’s is 0.17/0.4 W/m°K: the advantage in using oil or resin is evident. The filling material must be able to fully occupy all the spaces between the coil and the metallic case. Nitrogen and oil, by their very nature, occupy all the free spaces. The oil currently used is free of PCBs and other dangerous substances, and a potential leakage would be immediately visible. When using nitrogen, if the case is subjected to cracking, leakages are inevitable and difficult to be detected. On the other hand, there are no leakages when resin is used. Even if nitrogen is not flammable, there is still a risk of fire, because of the intrinsic flammability of polypropylene.